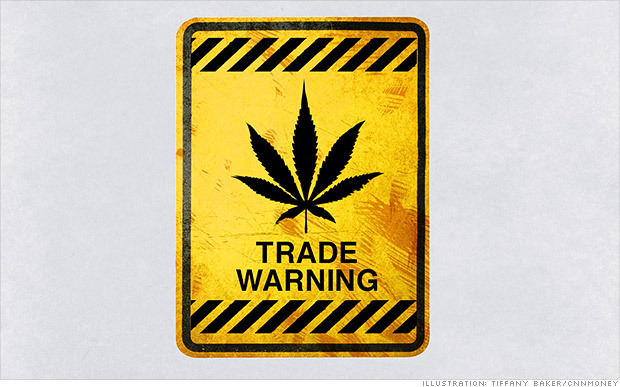 SEC says penny stocks in the marijuana business are risky. Marijuana may be legal in some states, but regulators say investors should use moderation when buying pot stocks. The Securities and Exchange Commission issued an alert Friday about the risk of fraud in thinly-traded shares of companies involved in the legal marijuana business. The SEC warns that "fraudsters" may be using the excitement about the boom in recreational marijuana in states where the drug has been legalized, such as Colorado, to dupe investors in penny stocks. "We know from experience that fraudsters follow the headlines," said Lori Schock, the official in charge of investor education at the SEC. "Given the attention that marijuana-related companies have attracted recently, we urge investors to exercise caution when looking at investments in this space." The commission suspended trading in shares of Denver-based FusionPharm Inc. (FSPM), which makes "cultivation systems" for cannabis growers. The SEC said "questions have been raised" about the accuracy of FusionPharm's financial statements, including its revenue numbers. The SEC has targeted five other "micro-cap" companies in the past two months that are involved in the legal weed business. It recently suspended trading in Cannabusiness Group Inc., GrowLife Inc. (PHOT), both based in California, and Advanced Cannabis Solutions Inc. in Colorado. The suspensions generally last for 10 days. By most accounts, demand for marijuana has exploded since Colorado legalized it for non-medicinal use on New Year's Day. Colorado expects to raise about $184 million in tax revenue from marijuana sales in the first 18 months. Washington also legalized marijuana for recreational use this year and a few other states are considering similar changes in regulation. But the opportunities for investors are still largely limited to shares of small companies that trade over the counter, rather than on a large public exchange. While all publicly traded companies are required to disclose certain information to the SEC, the commission says investors are often in the dark about the financial condition of companies that are not listed on the NYSE or Nasdaq. "When publicly available information is scarce, fraudsters can more easily spread false information about a company, making profits for themselves while creating losses for unsuspecting investors," the SEC said in its alert. In other words, investors should do their homework on pot stocks or else their portfolio might go up in smoke.